Tzolk’in. Tzolk’in. Tzolk’in. That seems so hard to pronounce, but really isn’t. Just as the game isn’t hard to play, even though it looks very complex with the gears and all. Initially, it’s just another worker placement game with some cogs that move. But the truth is a lot better. The game is not about the doomsday that didn’t happen, but the life of the Mayans that lived by the calendar. And you’ll have the privilige to play along. In order to win you need to have the most victory points at the end. But to get to the end, you need to feed your workers, please the gods, and time it right. And the calendar is there to help you time your moves and make the best of the situation. So let’s check out the player board. The main board really stands out from other boards. Its background has nice graphics with pretty colors, and it’s easy to find what you’re looking for as well as blending together nicely. But what you’ll also see is a large cog in the center of the board, with 5 smallers cogs connected to it. When you spin the middle cog, all the other cogs move along in the opposite direction. On the smallers cogs you’ll find spaces for small worker pieces, and when you spin the cog, the pieces move along with it, moving it from one available action to anoter. Each player receives 3 workers which are just small cylinders, but they fit nicely into the cog areas. Resources consist of wood, gold and stone, which are just small cubes. The gold and stone might be a bit hard to separate because of similar colors, but that’s not really a problem throughout the game. Food tokens are nice, and are all placed on the big cog in the center, making it available for everyone. But the real neat part is the crystal skull. Transluscent and blue plastic crystal skulls. On your turn you must do only one of two things: place workers, or retrieve workers. When you place a worker you must pay the cost in food. The more workers you place on the same turn, the more expensive it is. You must also place each worker on the cheapest available spot on the cog you wish to use. When you retrieve workers, you perform the action it was placed on. You may place or retrieve as many workers as you want or can afford, but you cannot do both. When the cogs turn, the workers will move along to the next available spot – which usually is a more profitable action. This means that the longer you wait to retrieve a particular worker, the better its action will be later in the game. There are 5 cogs to place you workers on, each providing their own special actions. I won’t go into detail, because there’s a lot of them. One area is all about food and wood, while another focuses on stone, gold and crystal skulls. A third allows for technological advances and buildings, and the fourth provides more workers and favor with the gods. The fifth cog is all about favoring the gods and placing crystal skulls in a holy circle. Once all players have done one action, the cog turns. The start player gets a special action once in the game: turning the cog two steps instead of one. This can really have a deep impact on the game, and might finish the game sooner than you’d like. Four times during the game, there’ll be some kind of worshiping of the gods. There are three gods represented by their own temple, and you may position yourself on the temple steps, gaining the favor of the gods. When it’s time to worship, you’ll get victory points or goods. But first, you’ll need to feed your workers using corn, which also acts as currency in this game. At the same time you must be careful not to anger the gods, or you’ll receive negative points. You’ll anger them by not having enough corn during the came to place workers, and you can beg for help to receive some corn. The more workers you have (up to 6), the more corn you’ll need. What I really like about this game is the theme. The cogs themselves are not just there for show, they act as a calendar – just as they used to for the Mayans. When you place a worker, you are kind of predicting when it’s best to sow and harvest to get the best spoils. The longer you stay on the cog, the earlier you were prepared, knowing what seasons were to follow. The calendar itself was also turned to indicate the day and season of the year. Turning the cogs just feel right for this game, and the actions are more lucrative as the cog turns. I really enjoy this mechanism. This is a game with almost no luck. Starting resources and available monuments for purchase are drafted at the start of the game. Other than that, the buildings are refreshed half-way throught the game and when purchases are made. The rest is all up to the players. Everything is visible for everyone, so you can plan ahead and make sure you get the benefits before your opponents. Since there is such little luck involved, it might almost seem very repetetive. But fortunately, the game is very different every time. When you place, where you place and what the opponents do. Almost never the same. If playing with 2 or 3 players, dummy-workers are placed at the very start of the game, just to occupy certain spaces. Every cog is available from the first move, and every action will become available shortly. With the many technologies, buildings and actions so available, it might seem overwhealming at first. There’s a lot to take in. The worker placement part is very easy, but all the options will take a play-through to really grasp. The second game will be a lot better. Corn-ageddon. Corn-aclysm. Corn-ocalypse. Tzolk’in: The Mayan Calendar may not have anything to do with doomsday predictions, but running out of corn in this game feels like the end of the world. You need it to place your workers, to feed your workers, to trade for resources. If you deplete your reserves, you must resort to begging — incensing the gods for your trouble. Also known as “that Mayan game with the gears,” Tzolk’in introduces unique mechanics and components that refresh an otherwise-predictable genre of board games. As with many worker-placement games, you place workers to gather resources and use those resources to construct buildings and develop technology for victory points and gameplay bonuses. Every few rounds a temple-scoring phase commences, requiring you to feed your tribe but also awarding VPs or resources for climbing the temple steps. Beyond the basics, Tzolk’in innovates worker-placement significantly by introducing action tracks. Instead of placing a worker on an action space and executing that action, you place the worker on an action track. Then, every turn you leave the worker on that track, it advances to a better possible action space that you use when you remove the worker from the track. Example: On turn 1 you place a worker on the food track on the action space “Harvest 4 corn”. You do not take the corn when you place the worker. At the end of turn 1, your worker advances to the next food-track action “Harvest 5 corn”. Now, on turn 2, you can remove the worker from the food track to add 5 corn to your supply — or leave it on the track and take an even better harvest action on a later turn. Each of the 5 action tracks generally focuses on a specific area, like harvesting corn, advancing your technology, or climbing the temple steps. Placing workers on a track costs corn and also increases the cost for other players to place on the same track in the same round. By timing when you add workers to an action track or remove them, you can outmaneuver your opponents and beat them to the best action spaces, the best buildings, and the highest temple steps. Win by having the most victory points at game-end — and there are many ways to earn them. Climb the temple steps to score points in temple-scoring phases. Mount crystal skulls on the temples via the crystal-skull action track. Construct buildings, including special “monument” buildings that award bonus VPs for developing your tribe. Example: A monument will award bonus VPs for advancing on the technology track, or for harvesting lots of corn. It is also possible to lose VPs throughout the game by failing to feed your tribe or falling too low on the temple steps. The Tzolk’in was the master Mayan calendar. Historians speculate that the ancient Mayans used the calendar cycle for planting and harvesting crops, birthing children, beginning construction projects, and organizing religious rituals. All of those elements figure into Tzolk’in the board game — but the components really evoke the theme. The designers of Tzolk’in have contrived an absolutely inspired component-implementation of the unique action-track mechanic. Each action track is represented by a plastic gear, mounted on the game board around a central hub with teeth connecting each gear to the hub. You place your workers on the action-track gears, and at the end of the round you rotate the hub — which rotates all 5 gears too, advancing everyone’s workers on all the action tracks simultaneously. Besides rotating the gears, the hub itself functions as a calendar, indicating the current game round, when the temple-scoring occurs, and when the game ends. Even though the Aztec sun stone depicted on the hub may be inaccurate to the Mayan theme, it looks fantastic when painted (caveat: you have to paint it yourself). And the crystal skulls? Probably not historically accurate either, but hey, we can allow artistic liberties for such shiny components. Ordinary wooden resource cubes, cardboard corn tiles, and cardboard building tiles are sturdy and functional, even if they do look mundane next to the exotic gears and skulls. + Action tracks add a new level of complexity to worker-placement, compelling you to plan your strongest actions several turns ahead. + Inspired gear components advance the action tracks effortlessly and also function as a thematic in-game calendar. + Unique sets of starting resources for each player and randomly drawn buildings can change your strategy and add replayability. – The resource-track strategy tends to dominate all others unless multiple players compete for it in a 3/4/5-player game. – Advanced play tends to proceed formulaically, according to a limited set of ideal actions, significantly diminishing replay-value unless you start adding house rules. – Since effective play demands thinking several turns ahead, slow or indecisive players will bog down the game. Every time my group plays T’zolkin, I am sure to utter three phrases at least once each. The first is, “Man, I love this game!” It’s true, I do. I love the mechanics; the wheels, (I painted ours, and added the little temples you can buy for the wheels, it is blinged out, baby!) putting down and picking up workers, advancing up the temples. The components are fantastic, with nice wooden bits and bobs, cardboard tiles, as well as corn and wood chits, that feel substantial and holding up well and a fun puzzle piece board. The thing I love the most about this game though, is that you really have to engage your brain. There is hardly any luck in this game, only the luck of the draw in your starting tiles and in how the building and monument tiles are laid out. If you aren’t prepared to put on your thinking cap, it might not be the night for T’olkin. The second phrase I am sure to say is “Man, I really hate this game.” Usually it is uttered after the second food day, when I realize that the strategy I had prepared before hand has been totally thrown out the window, I no longer have any idea what I am doing, and that I am going to lose, again. I have lost this game, a lot. Usually that would make me not want to play anymore, but not with T’zolkin. No, with Tzolkin, losing just means you need to try another strategy. Was everyone going for skulls? Do you need to diversify more? Play heavily on corn? Focus on climbing the temples? So far, my group has not found one reliable indicator of success, which leads me to my third phrase…. “We need to play this again, right after we finish this game!” Every single time we play, I feel the need to try out my next strategy right after I finish losing the current game. It seems to me that has to be a hallmark of a great game, when, even though you repeatedly lose, you still want to play again! When I first saw this game set up, I thought that the giant gear in the center was such a gimmick and couldn’t possibly lead to interesting gameplay… boy was I wrong. This euro style worker placement game is very deep and seriously makes you think and plan. The strategy here is not just what you plan to do this turn, but you must calculate many moves in advance, sometimes 2, 3, or even 4 turns ahead. And by turns, this game literally revolves (puns intended) around turning a giant gear system. The victory conditions all feel very Mayan…the three main ways to win are: —build a temple to please the gods, but dont **** them off or suffer their consequences. —Use the crystal skulls to gain victory points. —construct buildings worth points. Ok well that last one is not unique at all. In fact it reminds me very much so of Puerto Rico or 7 wonders with some of the later buildings reminding me of the guild halls from each game. If this game has any short comings, its that you can simply ignore whole paths of victory points, which I feel is an issue in many euro games. I can completely choose not to get any crystal skulls and focus exclusively on building the temple and base my strategy around that. Being that there are many avenues of victory, the player to win is most often the one who chooses a path that the other players are not competing for control of. Other than blocking points from my opponents, there is no real benefit to diversifying my strategy and dipping my fingers in each vein of victory points. Its almost always better to stay focused in one area. Regardless, the mechanic alone of the gear is enough to keep me coming back for more. Mechanically Its one of the most unique games I’ve played and certainly deserves a place on your game shelf. My group played this game during our last game night and for one member of the group it was a first play through while my wife and I have played a few times in the past. Just enough to know the rules pretty well but not enough at all to really have a grasp on the game. Game ended up with me winning by a large margin namely due to a very poorly understood rule. Though the consensus was that I would have squeaked out a win over the 2nd place player either way. So lets start with something I like about the game, it’s pretty to look at. Every part of the game really fits with the theme here and the parts are all solid. I love that the game just feels Mayan with every little detail. Sadly, for me personally that’s where the good times end. Since I was just saying how nice the parts were I am going to talk about why I only gave it 2 stars, it’s the board. I enjoy spinning the wheel but the way you have to put this game back in the box is horrible. The pieces do not fit good in the box at all. With the spinners permanently attached instead of being removable it means that the board takes up a huge amount of space in the box. Also, we found out when playing this time the other evil of having them permanently attached, the board warps under its own folded up weight. In our game in order to not damage the game board (further) we had to prop one corner up with a pencil under it, otherwise you could not spin the gears without it bumping another section of the board. This is just bad, whoever designed how this game would be stored utterly failed at it. As for the gameplay itself, I find it more frustrating than fun. Everytime I play this game I find myself extremely frustrated at the beginning because I just can not wrap my head around the way that the dial spins and changes what I want my action to be. Please understand that this is not necessarily a failing of the game more of my ability to wrap my head around it. Though my wife also was frustrated with this process throughout the game and we have both played in the past. The new member didn’t seem to be bothered by it. Beyond that the game is okay, I really dislike games with a food requirement personally because it makes me feel very trapped into taking my actions because “**** I MUST get this” instead of “oh man I want/need this for my strategy”. This game really builds on that trapped feeling, I never put a worker down going “this is what I really wanted to do here”, its always “well I guess I have to do this thing because otherwise I am screwed”. It’s not a good feeling for me. As for replay value and learning curve for me they go hand in hand. I end up feeling like I am relearning the spinning gears every time I play and thus never feel like I am improving at the game. Making me not really want to replay it, which in turn means that we go longer without a replay, which makes it harder to pick up again….it’s a bad cycle. All in all, While this game has a great theme and can have moments where it’s amusing, I just am not a big fan. If my wife wants to pull it out I will play but it’s never going to be my personal choice for a game night. We(me and my girlfriend) got this game exactly when it came up. We thought it will be really interesting and it was. The first impression you get when you open the box is already of good quality and intriguing mechanisms. The rotating wheels are something that really attracts people into playing the game. All my friends know the game as the “rotating-wheels game” :). The game is of medium complexity since there are lots of mechanism and lots of ways to win points but everything feels natural and logical. Even though my girlfriend is not one to like complex games, this one is one of her favorites. The replay-ability of the game is also very high. Since there are lots of ways to win points, that means that are lots of ways to go though the game. There is nothing mandatory that needs to be done every game if you want to win. You can simply choose your own way of playing each time. A VERY complex worker placement game. While I enjoy the game, I also can find parts of it annoying. For instance, another player can totally screw up your strategy by taking the first player option and advancing the wheel 2 times. This can only be done once per game per player, but my first time playing, I was really struggling with the wheel mechanics and had my entire strategy crushed by someone taking this option. There are a ton of options to score. It’s hard for new players to understand the economics of the game. Really, where I would say most games require 1 play to get down, this one I would say requires more like 2 or 3. Some people will argue I am sure, but for me, this is not a game I would break out for anyone very experienced gamers. An experienced gamer that has played this before will trash entry level gamers out of hand, IMO. 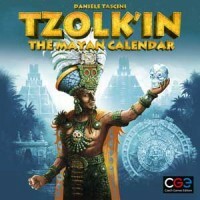 Add a Review for "Tzolk’in: The Mayan Calendar"